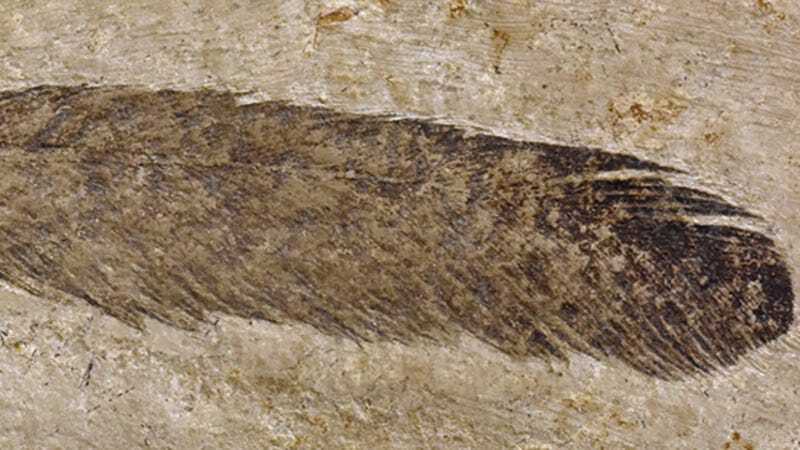 Found in Germany in 1861, this is the first fossil feather ever discovered. Using advanced imaging technology, scientists have shown that a fossilized feather uncovered in the 19th century likely didn’t belong to the bird-like Archaeopteryx as conventionally believed. New research published today in Scientific Reports posits one such impossibility, concluding that a famous feather fossil couldn’t possibly belong to an equally famous bird-like dinosaur, the Archaeopteryx. The 150-million-year-old fossilized feather was uncovered in 1861 within Late Jurassic limestones from the Solnhofen area of southern Germany, and it was the first fossil feather ever discovered. Very shortly afterward, with the discovery of an Archaeopteryx fossil—a critically important species linking reptiles to birds—scientists connected the two together, figuring the feather likely belonged to the Archaeopteryx, though the proposed provenance of the feather remained controversial owing to missing elements in the fossil. Without evidence of the quill, for example, scientists weren’t able to tell which part of the body it belonged to. The feather as seen under normal light (top) and an early drawing of the feather, showing an assumed quill. The new study, co-authored by paleontologist Michael Pittman from the University of Hong Kong, has finally provided this much needed evidence through the use of Laser-Stimulated Fluorescence (LSF)—a cutting-edge imaging technique used to peer inside fossils. Previous analyses of the isolated feather were controversial owing to the nature of the fossil itself. Unlike other fossilized feathers, which tend to be preserved as impressions within the rock, the traces of this feather were laced onto the rock as a dark film. What’s more, the fossil contained no evidence of a quill; it’s incomplete preservation thus made it impossible for scientists to identify the type of feather, be it primary (large wing feathers required for flight), secondary (small wing feathers that provide lift), or primary covert (also known as a tail feather). Without the quill, the type of feather could not be established—and that’s where the LSF was able to help. The feather as seen with LSF, and the ghostly impression of the quill not seen with prior techniques. With the complete feather now visible, Pittman, along with study lead author Thomas Kaye from Arizona’s Foundation for Scientific Advancement, were able to compare the feather to those of confirmed Archaeopteryx feather impressions and those of living birds. Scientists had previously assumed the feather was a primary covert from Archaeopteryx, but the new analysis ruled that out, as the feather lacked the required s-shaped centerline. Further comparative analyses showed that the feather couldn’t possibly belong to Archaeopteryx, whether it be primary, secondary, or covert. Indeed, the true owner of the feather is now a mystery to be solved, but the researchers said it likely belonged to an animal not too dissimilar from the Archaeopteryx. This remarkable conclusion suggests a couple of things: the diversity of bird-like Jurassic dinosaurs is likely greater than we’ve appreciated, and there are likely more fossils of unknown species still waiting to be discovered. Also, and as Pittman pointed out, there’s hope that “additional feather-preserving specimens of Archaeopteryx will be found in the future to further clarify the details of this important early bird.” For sure—more fossils will help to further validate these new findings, while also shedding new light on this exceptionally important species. As a final note, this new study is yet another example of how new technologies are making old fossils relevant again. For modern paleontologists, important work can be done not just by digging into rocks, but also by visiting museums.